North Carolina Music Factory – What Is It? By now you know that Charlotte is extremely versatile in what it can offer its residents and visitors…Are you a lover of great food? Move to Charlotte. Craft beer enthusiast? Move to Charlotte. NASCAR fan? Move to Charlotte. Lover of all nature landscapes – lake, mountains, AND beach? Yup, you guessed it…Charlotte is the place for you. But would you have guessed that Charlotte is also home to a number of live music venues on the rise? The NC Music Factory, AvidXchange, is one of the most talked about and most visited places in the city. The Factory itself is comprised of a number of venues located centrally within North Carolina Music Factory Blvd; The Fillmore, The Underground, VBGB, Charlotte Metro Credit Union Amphitheatre, and 8.2.0 are the major attractions within the Music Factory. Aside from the Music Factory, there are a number of other music (and comedy!) venues throughout the city, including the PNC Music Pavillion and Spectrum Center, both of which entertain local and regional artists alike. What could be said about the Charlotte music scene overall? It’s always existed, but in the somewhat recent past it was no more note-worthy than that of the average small town with a few bars open to local artists and open-mic nights on weekends. Recently however, the want for more live music in the Charlotte area has increased, creating a rapid uprising in venues and invitations for both local and big-name artists like Lana Del Ray, Killswitch Engage, Kid Rock, and Of Mice and Men…a few acts that are scheduled for shows in early 2018. 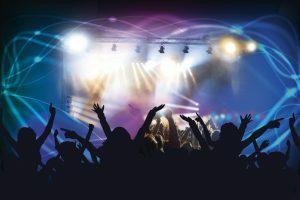 While it is true that a few music venues have sadly closed their doors for good within the last couple of years (for various reasons, most of which center around owners expanding to a different business focus), there are still an abundance of places you can go to see live music on the regular. With the interest in live music in Charlotte peaking, you can expect the music scene to transcend even further from its current status in the near future. So, what all does the Music Factory have to offer and why should you care about it? Well, music lover to music lover, it’s one of Charlotte’s most exciting places to be, not just for the talent, but for the overall experience. The state-of-the-art sound systems alone is what entices many artists to play at the factory’s venues. The Fillmore, for example, exudes great sound quality, and is a favorite among artists and fans due to the “unique qualities of the theatre’s ambience, feel, and traditions” according to the Music Factory’s website. It’s stadium-style tiers also allow for perfect sight-line no matter where you’re seated. Within some of the venues are some really unique restaurants, most of which have their own distinguished theme; ROC’s jazz bar is the newest addition to the factory featuring local and regional jazz artists, VBGB appeals to craft beer lovers, Wet Willies is known for their “World Famous Daiquiris”, and La Revolucion attracts those seeking authentic Mexican food and cocktails. Then you have 8.2.0, which has something for everyone; with an upscale karaoke lounge hosted by local Charlotte actors, large event rooms with soundproof walls and service bars, a vintage arcade room, gourmet pizzas, plus craft cocktails and cold brew coffee on draft, among other beers and spirits. The Factory Cafe is a standalone cafe-style restaurant that serves breakfast, lunch and dinner daily. The Comedy Zone is Charlotte’s most popular comedy club, known to host a variety of talents like Brent Morin, Michael Blackson, Marlon Wayans, and Chris D’Elia, and is also located within the Music Factory. Traveling a significant distance to explore Charlotte? You’re in luck – you’ve got a multitude of great hotels right in the heart of the Queen City to choose from, the closest to the factory being the Holiday Inn Center City, which offers complimentary transportation to the factory and discounted rates. The NC Music Factory is definitely one of Charlotte’s most popular attractions for visitors and locals alike. See below for a list of all of the venues within the factory. Have a funny or crazy awesome story about an experience you’ve had at the factory? Let us know in the comments!